Explore a mysterious ruin of the prior worlds - or build ancient sites for your campaign! Mysterious, powerful, and usually dangerous the vast ruins of the prior worlds contains secrets and marvels beyond imagining. 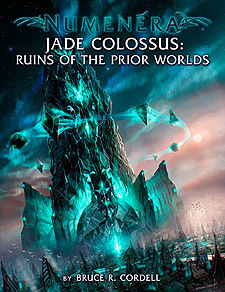 Explore one such gigantic ruin - the Jade Colossus - in detail. Or create your own, using the Numenera Ruin Mapping Engine to build ancient sites large or small, with all the wonder and weirdness you expect in the Ninth World setting. The Jade Colossus, a massive prior-world site that emerged recently from the earth. Brave the Yovok Hive, navigate Wranna's Way, or seek the Canticle at the heart of the Red Labyrinth. Bollarad, a prosperous but isolated city partially uprooted by the Colossus. Explore the Mirror Fortresses, trade at the ceaseless Market, or seek information at the Church of the Whisper. The Numenera Ruin Mapping Engine, a robust system for generating maps and content for prior-world sites. Expand the uncharted areas in published adventures, make the Jade Colossus even bigger, or create entirely new prior-world ruins for your campaign, with all the mystery and weirdness of the Ninth World baked right in! New character options, including new foci and organisations, and new creatures to encounter.